A teen who murdered a "loving grandad" was snared after sharing boasts about the attack on social media. Leary Dalton-Byrne, 18, stabbed Dean Ward with a carving knife after asking the 45-year-old - who didn't smoke - for a cigarette. He was arrested after the recorded "confession" shared online was seen by West Midlands Police. 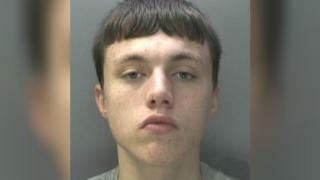 At Birmingham Crown Court, Dalton-Byrne was given a life sentence with a 17-year tariff. He had denied knifing Mr Ward repeatedly in Finchley Park, Kingstanding, Birmingham, on 20 June 2018, but was found guilty at trial. Police said the victim was with a friend when they were approached by Dalton-Byrne and another youth at about 06:30 BST. When Mr Ward was unable to give the killer a cigarette, he was stabbed in the legs several times, police said. Despite the recording, the force said Dalton-Byrne denied being responsible and tried to blame his friend. Det Ch Insp Peter Dunn said: "Dean's family has been left devastated by the death of their loving granddad, father, son and brother. "We hope this sentence brings some closure to his family and sends a strong message to those willing to carry knives on our streets". Follow BBC West Midlands on Facebook and Twitter, and sign up for local news updates direct to your phone.